Vox, the media company whose main mission is to ‘explain the news from a liberal standpoint’ for it’s mostly ‘millennial’ readership was founded by Mr Ezra Klein, a former journalist at the Washington Post. It has become an influential website over the years reaching a major part of America’s youth. The viewing numbers for each explanatory video on Youtube of an issue in the news reaches in the millions while data shows that the site has more than 60 million unique visitors per month. Related coverage: <a href="http://thegoldwater.com/news/35082-South-Africa-EFF-Fears-Group-Of-White-Right-Wingers-Trained-By-Jews-To-Be-Snipers-Video"> South Africa – EFF Fears “Group Of White Right-Wingers Trained By Jews To Be Snipers” (Video)</a>. The founder, Mr Klein, admitted that his audience was more Democrat than Republican, stating: "We watch our audience data pretty closely, and our audience data does not show or suggest to us that we are overwhelmingly read on one side or the other of the political sphere, which is good…And overall our audience leans a bit left, but it doesn’t lean overwhelmingly so." Vox also has a show on Netflix called ‘Explained’ which highlights a segment in the news on a weekly basis and explains it in a 15-minute video documentary. I do admit having watched it before and was surprised that in order to explain the racial divide in American they invited two Democrats but no Republicans. This week they released a story explaining what was behind US President Donald Trump’s tweet. 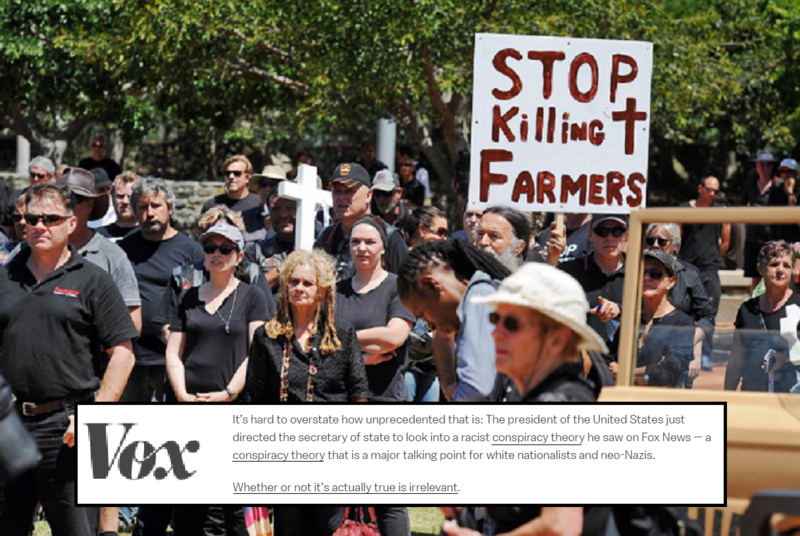 Vox, just like The Guardian or CNN, goes on at length that the theory is mostly a conspiracy made up by White Nationalists and Neo-Nazis whilst leaving out any actual events that occurred in South Africa itself where there are dozens of witness stories of farmers and videos showing the left-wing EFF-leader Mr Julius Malema threatening to kill ‘white people’. Vox lays bare the current state of Mainstream Media in the US now. Whether or not anything that Mr Trump states is true is irrelevant, whether or not it can be used against him is. this is proof that we do not want to bring in large numbers of African invaders into western lands. If this isn't stopped soon there will be an indian uprising in the states to claim back "their land"! Just like the media’s response to Trumps comment about “wire tapping” or the no go zones in Sweden? If so it’s just a matter of time till we get a violent farm takeover or the aftermath on video, or white farmers and their families looking at refugee status. Then the media will just ignore it but the people with even a sliver of intelligence will see that our President was trying to get out in front of the atrocity.